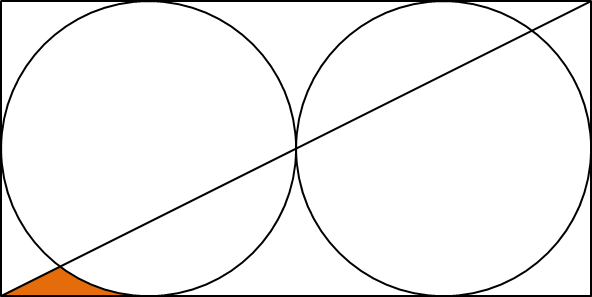 A square is drawn around a circle as shown in the diagram below on the left. We shall call the blue shaded region the L-section. A line is drawn from the bottom left of the square to the top right as shown in the diagram on the right. We shall call the orange shaded region a concave triangle. It should be clear that the concave triangle occupies exactly half of the L-section. Two circles are placed next to each other horizontally, a rectangle is drawn around both circles, and a line is drawn from the bottom left to the top right as shown in the diagram below. This time the concave triangle occupies approximately 36.46% of the L-section. If n circles are placed next to each other horizontally, a rectangle is drawn around the n circles, and a line is drawn from the bottom left to the top right, then it can be shown that the least value of n for which the concave triangle occupies less than 10% of the L-section is n = 15. What is the least value of n for which the concave triangle occupies less than 0.1% of the L-section? This is a so-called paper'n'pen problem because you can solve it without a computer. But I like computers so much that I decided to write a proper program that solves this problem by throwing CPU cycles at it ! If there is only one circle then it covers an area of pi r^2 = pi 1^2 = pi. Its bounding box covers an area of 2^2 = 4. Knowing the intersection I proceed with the same motivation: keep solving it numerically ! At first I checked every possible size of 1,2,3,...,100,... circles whether the area is below 0.1%. It took a little more than one second to find the correct solution. check only every 64th number: 64, 128, 192, ... circles and when the area is below the limit then go back and check every 32nd, then 16th, ... until step = 1. Now the result is printed after less than 0.1 seconds. As I told you before, you can solve this with pen'n'paper (or Wolfram Alpha). I had fun writing this solution - for whatever reason I like numerical approaches such as Monte-Carlo simulations. // I entered those formula in Wolfram Alpha and didn't like the output ... so let's solve this numerically ! // numerically integrate area between intersection and "where the first circle touches the box"
// area small enough ? This solution contains 16 empty lines, 29 comments and 2 preprocessor commands. The correct solution to the original Project Euler problem was found in 0.04 seconds on an Intel® Core™ i7-2600K CPU @ 3.40GHz. 20% Project Euler ranks this problem at 20% (out of 100%).